The World of Beer crew at the Augusta Craft Beer Festival. From left, Mat Schultz, Jimmy Powell, and GM Brett Matthews. I got the press release and thought “Augusta is coming up in the world.” I mean we already have great growler stops (Gravity Growler and the Hive) and some great eateries with great taps (especially the Hive and Fuse). The competition just grew. World of Beer has scheduled their grand opening for Monday, May 23, according to General Manager Brett Matthews. He and some of the WOB crew were at the Augusta Craft Beer Festival at Lake Homestead Stadium on Saturday. World of Beer was the festival’s main sponsor. 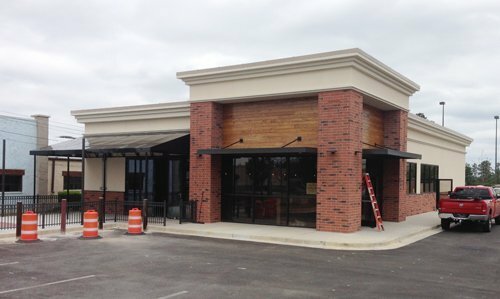 Located at the new stoplight in front of Kroger (across from Publix-2819 Washington Rd), this new 4,500 square-foot tavern will feature 50 rotating taps, 500 different bottles and something new to the area, a cask engine and an infusion tower. The infusion tower is something that Jimmy Powell, Market Development Partner for World of Beer, has custom developed for World of Beer. Powell says they will be working with breweries to come up with flavor infusions that compliment their beers. Then you’ll have the opportunity to purchase a infusion flight, 2 half glasses, one with the straight original beer and the other with the infusion so you can compare. The infusions will rotate on a regular basis. And they will also have a outside seating area to enjoy watching those stuck in Washington Road traffic after a hard day at work. And there’s a slew of TV’s inside to watch big games. World of Beer has over 75 locations in 20 states. The nearest locations are currently in Atlanta and Columbia. Southbound Brewery will be having a tap takeover on opening night on the 23rd. It will also double as a “keep the pint night” (you keep the glass). Celebrating the popularity of craft beer and its culture, WOB rotates taps daily so guests will discover something new and unique on every visit. WOB pairs its craft brews with the franchise’s signature “Tavern Fare” menu, featuring a variety of comfort foods and traditional bar offerings with a contemporary spin, such as Giant Bavarian Pretzels, a Guinness “Brat” Slider and the Chimay Burger topped with melted Chimay cheese made at the brewery in Belgium. This location is proud to partner with many local breweries including SweetWater Brewing Company (Atlanta, GA), Southbound Brewing Company (Savannah, GA) and many Georgia and South Carolina breweries. Local brewery relationships are a key part of the WOB tavern concept, as owners partner with many nearby breweries to offer tap takeovers, rare brews and beer education classes for the craft beer enthusiast. WOB-Augusta will serve lunch and dinner daily, and on Sundays WOB offers a unique BEERunch menu. Customers can anticipate WOB’s Happy Hour Monday through Friday from 3 p.m. to 7 p.m. and again from 10 p.m. to close that will offer select drafts and tavern shares. WOB will also host live music performances throughout the week and weekend. Be sure to check its website, as the performance schedule will change seasonally. Want to know the ins and outs of craft beers or what tavern fare to pair with your brew of choice? 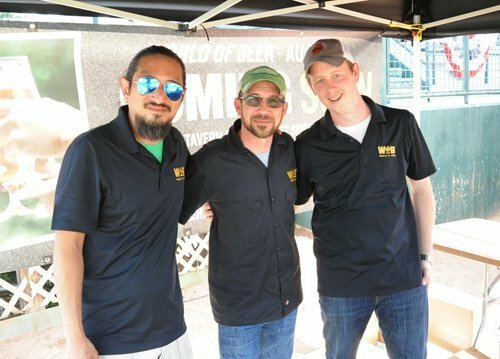 Specially trained WOB servers complete a two-week beer school and will be on hand to guide guests through the WOB experience centered around craft beer discovery, food and beer combinations, live music and a home for every sport-lover’s gameday. World of Beer’s Loyalty Club helps guests discover new beer styles, flavors and brands while rewarding them with points to earn gift cards and complimentary pub perks. Putting the WOB culture in guests’ hands, the loyalty program is easily accessed through the WOB app, available on iPhone and Android smartphones. Since opening its first tavern in Tampa, Florida, in 2007, WOB has grown to more than 70 locations in 20 states. What began as a neighborhood tavern to sample great craft beers and swap beer-talk for co-founders Scott Zepp and Matt LaFon is becoming a unique cultural phenomenon celebrating the world of craft beers, great food and camaraderie. WOB-Augusta will be open from 11 a.m. to 12 a.m. Sunday through Thursday and 11 a.m. to 2 a.m. Friday and Saturday. For more information, visit http://worldofbeer.com/Locations/Augusta.